Sharing Success in Supportive Care in Cancer! Invitation to Join Us! 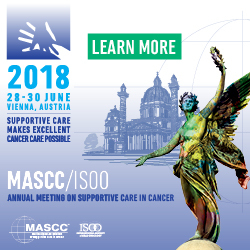 • We’re excited to officially announce that MASCC/ISOO 2018 will take place June 28-30 in Vienna, Austria. Rachel Gibson will again Chair the meeting and promises another exciting scientific program in a beautiful and historic city on the banks of the majestic Danube River. Watch for more information in future issues of the Society News! For questions, please refer to the meeting contact page.